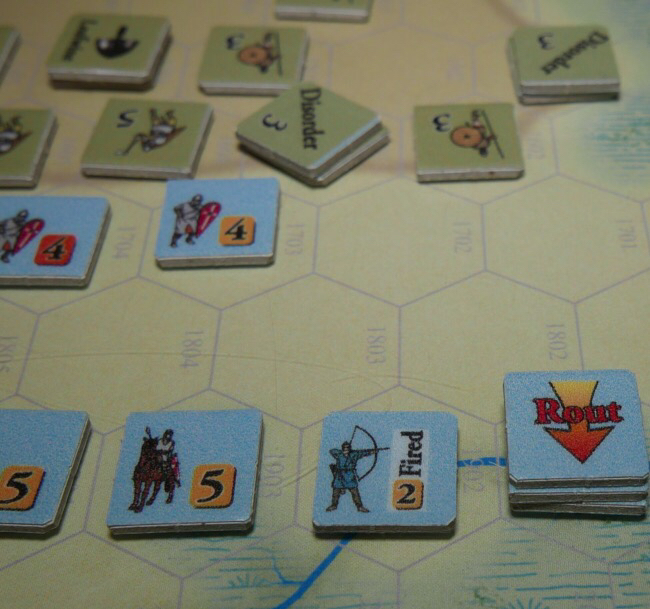 Battlefields and Warriors: 1066 - William tries again! 1066 - William tries again! Invasion 1066 - The Battle of Hastings is published by Revolution Games and covers the Norman attempts to wrest Senlac Ridge from the Saxon shieldwall and defeat King Harold. This post gives a light AAR on my most recent game. The Resource section provides a link to a more detailed examination of the system. Press 'Read More' for the rest of this post. I should mention at the outset that this is my own design. I am presently working on the sister game, Stamford Bridge, which is due to be published later this year. 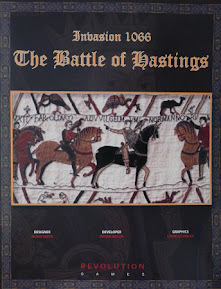 They share the same system, but Stamford is a hack and slash affair and Hastings is much more of a grind as the Norman army labours to get up that hillside and into the Saxon ranks. The resource section has a link to a good AAR that does much to explain the system, but today I am just out to enjoy the game with the writing being kept brief. We will be playing the historical scenario which actually starts on turn 3. Random Saxon reinforcements have been diced for and they will arrive on turns 3, 7 and 8. 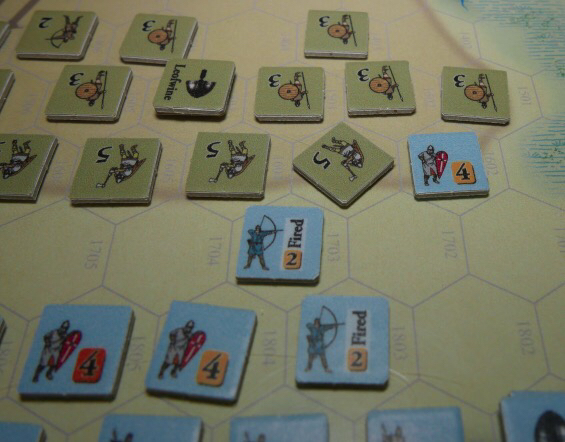 The battle opens with Norman archers firing along the entire front of the army. The outcome is fairly typical. Two Saxon Housecarl units are disordered and three of the archer units go 'out of arrows' and leave the game. 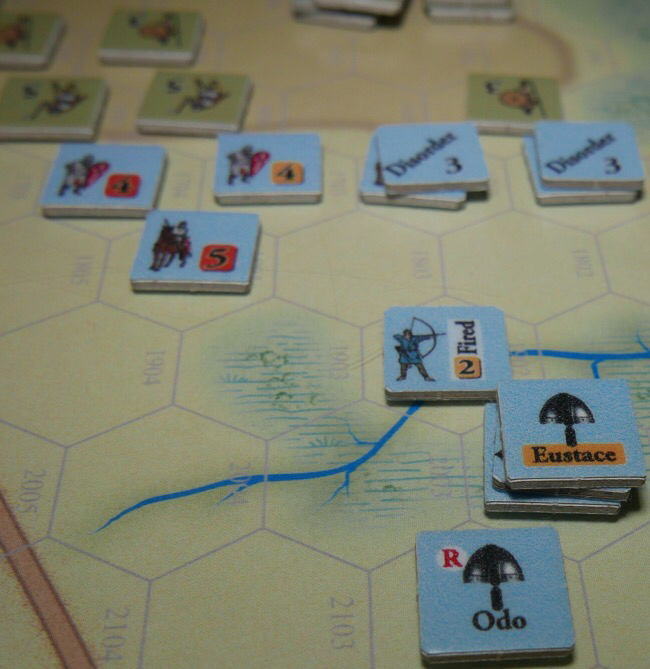 Four Norman spear units move forward to tackle the disordered units. The Saxon line takes this opportunity to use their one off allowance of hand thrown weapons, this disorders one of the attackers, while the other three attackers disorder themselves as their attacks fail. The two disordered Housecarls pull out of the line to attempt to re-order and their places are taken by units of the General Fyrd (who have a lower combat value). On the Norman right, a Housecarl is disordered by archers and again two spear units advance to attack. The first suffers an Attacker Eliminated result, the second gets lucky and eliminates the Housecarl and advances (mandatory) onto the hill. 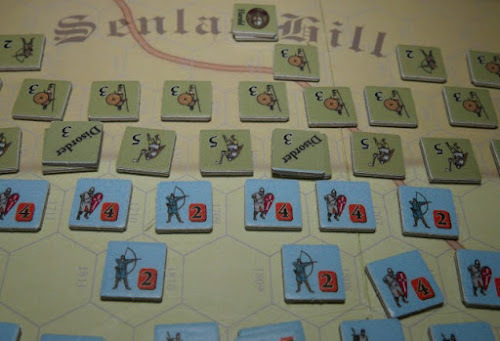 The adjacent Housecarl turns and attacks into the flank of the spear and eliminates it due to its +3 advantages (for strength and flank attack) - however the turned Housecarl has now exposed it's own flank to the Norman army as it must maintain facing when advancing after combat, leaving it vulnerable ... and so the first gap and vulnerable point on the hill has been created. The Norman cavalry will be released from its restrictions on the next turn and this spot will no doubt get prime attention. 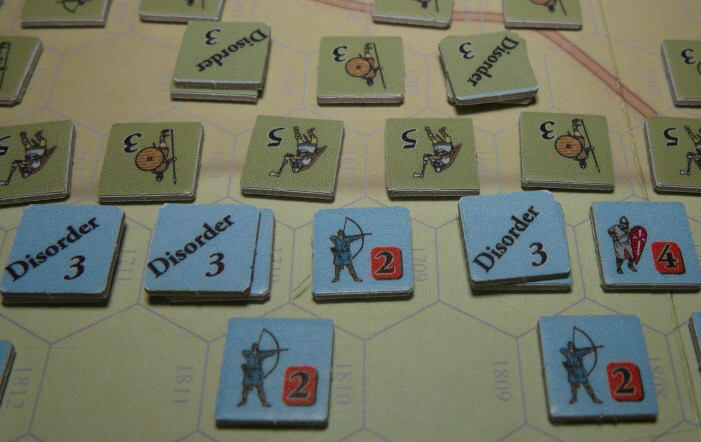 The Norman archers are mostly spent this turn, with all but two now residing off map in the 'out of arrows' box. The Normans have managed to get onto the hill at both flanks (Fergant led the attack on the left) and also have a small penetration in the centre. On the right the cavalry hit the flank of the Housecarl shown previously and removes the unit from play. The cavalry advance onto the hill (below). We get the first rout of the game. 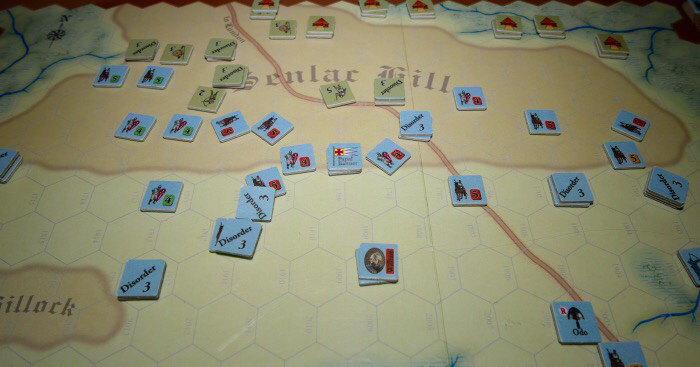 Saxons counter-attack the Franco-Flemish wing and destroy that cavalry unit that just climbed the slope. 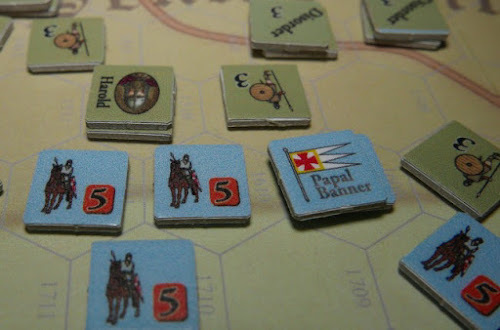 There are now three Franco-Flemish counters in the dead pile, so when units adjacent to the lost unit takes a morale check (stacked below Eustace), the 3 is added to the die roll. This causes a local rout and suddenly the Norman right wing looks to be in peril. 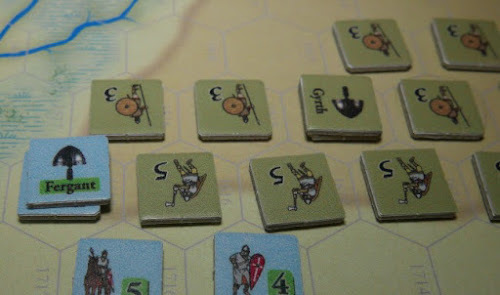 If Norman units rout, there is a chance that adjacent Fyrd will break ranks and pursue (Impetuous Saxons rule), but in this instance, they pass their impetuous test and retain their discipline. Both sides have taken heavy casualties and something of a stalemate develops. 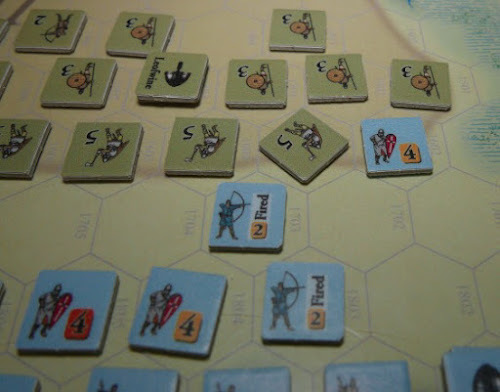 It is a good point for the Normans to consider exchanging the turn for a Lull turn, that will allow their army to re-organise and bring their archers back into the game - resupplied with arrows. However, they feel that they do not want to give up the gains made and want to keep the pressure on the Saxon line now that gaps are appearing. The Norman right (franco-Flemish) is in a pretty poor state, even though the way ahead looks ripe for exploiting. Much of the Norman right is either disordered or dead! Although the Saxons look strong, both the Fyrd and the Housecarls have taken 5 eliminations each. That means that when units take morale checks, 5 will be added to the result, making it increasingly likely that local routs will happen. Knowing that their time may be limited, they step up their attacks, even if that means coming down from the safety of the hill. In the centre they capture the Papal Banner. The Normans do not manage to take much ground, but they do re-capture the Papal Banner and they are quite lucky in getting a lot of disordered units back to full order. The situation looks perilous for the Saxons, so they try to regain the initiative by ordering an attack in the centre, during which time Leofwine dies. The death of a Saxon leader influences the future morale checks of all Saxon units regardless of whether they are Housecarl or Fyrd. The centre has become a right tangle as each side pushes to get a local victory and both sides have units with exposed flanks. But the turn goes badly for the Saxons. Gyrth dies and substantial numbers of the Saxon army are either disordered or routing - their army is breaking! Harold, his Housecarls and a couple of Fyrd units hurl themselves at the Norman centre, hoping to break it by causing routs. They are unlucky as the Norman side pass their morale checks despite their high casualty level.They capture the Banner once again, but the attack has been to no avail and in their failure to break the Normans they have simply become more embroiled deeper in the Norman lines. 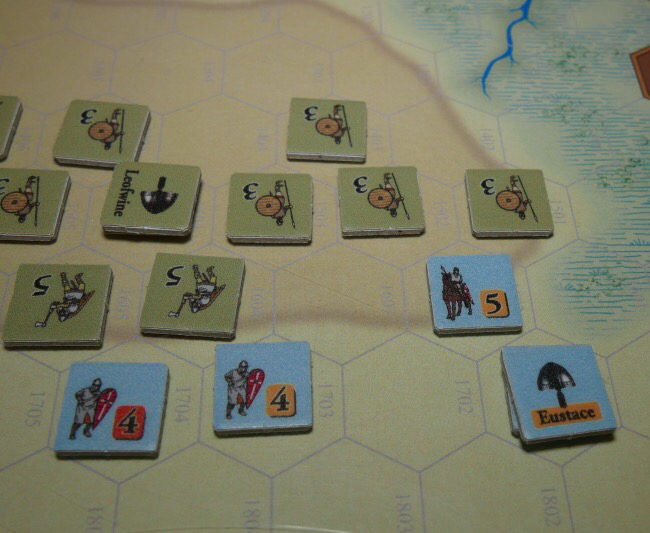 Harold is in a difficult position, he and his loyal Housecarls are attacked by Norman cavalry. The Housecarls are first disordered (taking them from strength 5 to strength 3) and then destroyed in a secondary attack. As the victors enter the hex, Harold fails his escape attempt and is killed. Final positions - the King is dead! 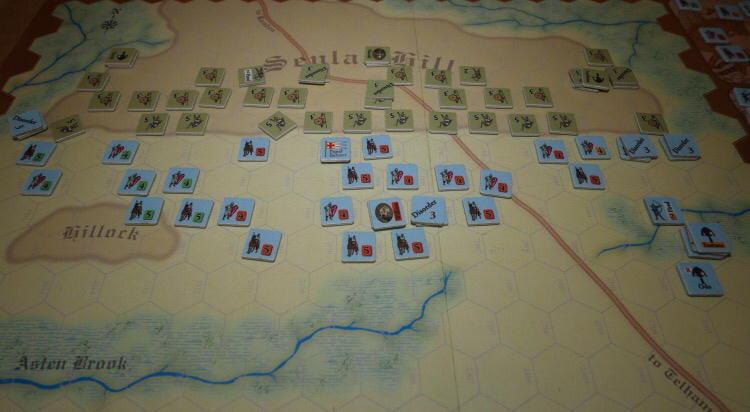 The scenario normally goes to turn 12 and a victor is determined based upon casualty levels and objectives, but when either Harold or William are killed, the game ends immediately with an automatic victory to the other player. 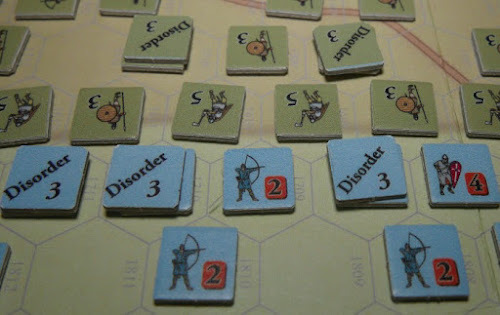 Even if this scenario had played to the end, with Harold surviving, the sums show that with most of Harold's army off or leaving the field, this was going to be a pretty convincing Norman victory. 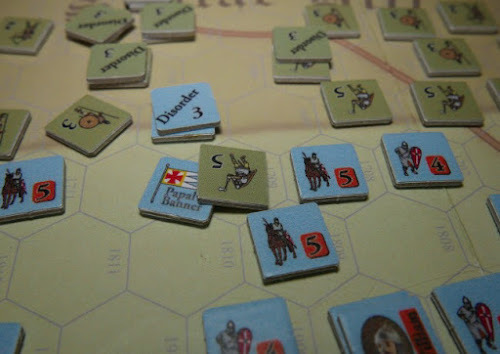 Harold's last moment gambit was unlikely to have swung the game, the Saxons had simply lost too much of their army to take advantage of a local enemy rout and the Normans were not sufficiently weakened for a single event to see them off. I enjoyed the return to the game. 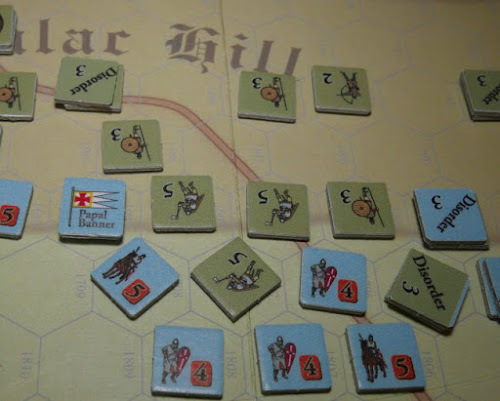 From the outset the Normans gained an early foothold on the hill, so looked to be in the better position, forcing the Housecarls to expose their flanks as they countered the threats. As a consequence, the close up fighting mostly on the slope prevented the use of any cavalry charges and risky feigned cavalry attacks were not needed. The lack of Norman routs meant that we didn't see even one Impetuous Saxon attack. It looks like the Norman decision not to take a Lull turn was justified and even though they nearly lost their right flank, the battle was won elsewhere. The Saxons will be disappointed that at least two of their attacks did not result in a Norman rout at the centre, as today the invaders seemed to have an uncanny ability to pass their morale checks. A fun game played out in just over an hour.